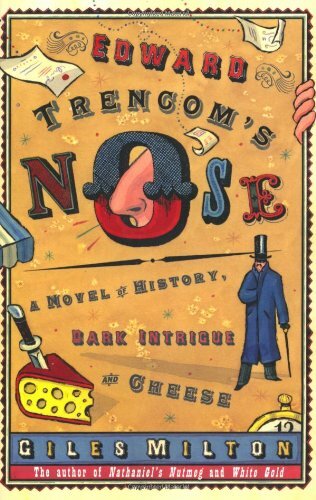 Edward Trencom’s Nose, debut novel from the popular history writer Giles Milton, is funny, witty in a neo-Wodeshousian sort of way and full of delightfully engaging characters. The Trencom family have been the acknowledged masters of cheese for 10 generations, running their London cheese shop since before the Great Fire of London and passing it down from father to son for over 300 years. Each eldest son also inherits a remarkable nose, a large aquiline nose with a prominent bridge and an extraordinary talent for smelling cheese, which Milton exploits hilariously and to capacity. Weight-watching cheese-lovers should avoid this book or the numerous evocative, aromatic scenes describing the finest cheeses from around the world will have you diving to the fridge for more than one or two wee morsels. This is a novel fashioned with style and elegance. An elaborate plot structure is interwoven with an account of Greco-Turkish conflict and delicately balanced with a narrow group of amusing, if somewhat one-dimensional, characters. The plot develops as Edward, the current owner of Trencom’s Cheese Shop and possessor of the finest nose in generations, finds a bundle of old family papers in the cellar. His discoveries, together with the machinations of friends and foes, start him off on a path of adventure – adventure, that is, in a very 1960s, middle class sub-urban style – which eventually both exposes and ties him to the fate of his forbearers. And here we come to the weakness of the novel: the way in which Edward’s adventures play out is utterly, utterly ludicrous and the farcical denouement is deeply unrevelatory. It is a brave and not wholly unsuccessful attempt, one suspects, to match the well-conceived plot to the mindset of its average players. Yet the overall result is unsatisfying. Make no mistake, this is a good and fun book to read, with lots of laughs and lots of cheese throughout, but the ending just doesn’t quite live up to expectation. Read the book for the pleasure of the journey, but don’t expect to enjoy the party when you reach your destination.